An aerial view of Sunrise Point Elementary School in Kansas. 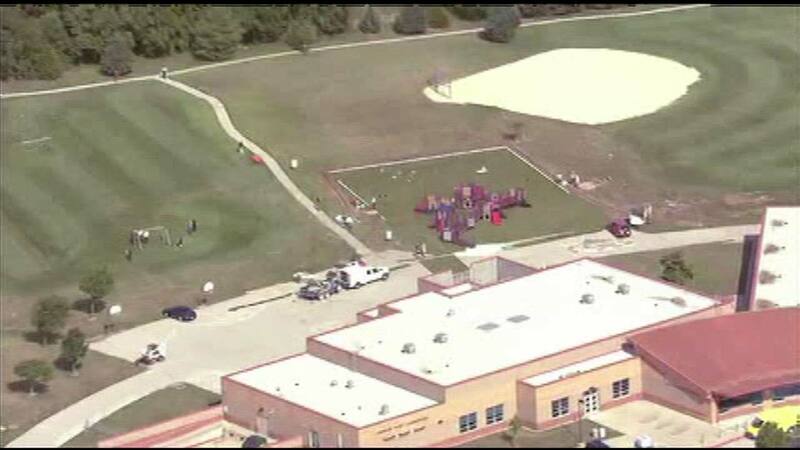 OVERLAND PARK, Kan. -- Authorities are investigating a shooting that critically wounded two contract workers outside a suburban Kansas City elementary school. District spokeswoman Becky Miller says no students were on campus. Overland Park Police said in a tweet that no school employees were involved. The Kansas City Star reports that the shooting suspect fled and tried to carjack someone at a car wash. Police say shots were fired but no one was hit. The suspect stole another vehicle at gunpoint a few minutes later. Lacy hasn't responded to phone messages left by The Associated Press.